Give me those old time gardening tools. Give me simplicity of design. Give me quality that lasts for decades. Give me the patina of age, of tools well used by past gardeners. 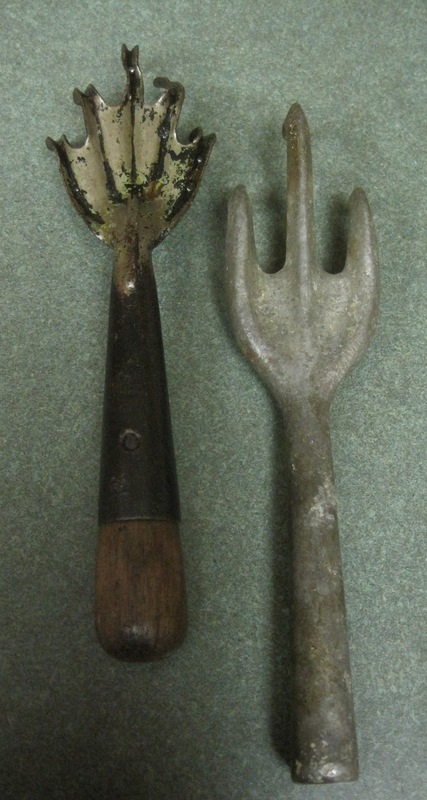 My sister-in-law found these two old garden claws at an antique store and wonder of wonders, she thought of me when she saw them and thought I might like them. She's very smart that way. I do like them. I like to think of the digging they did, of the seed beds they prepared. I like to think about what kinds of gardeners used them. No doubt, they were used by wise, old gardening men and women, who tended their gardens with care and consideration for their entire lives. I like to think they used these tools for decades, during a time when a few simple, well-made tools, were all a gardener needed to create a beautiful flower bed, a bountiful vegetable garden. The tool on the right appears to be made of cast aluminum. I like it, but I love the tool on the left, which, though not as well made, has a bit more character. It looks like a raccoon's hand and has a hollow handle. A hollow handle. If I look down that hollow handle at just the right angle, I think I can see a piece of old paper stuck down in there. Does it have something written on it? Does it contain a secret message, perhaps more gardening secrets? Could it be? Could it be that this gardening claw contains the thirteenth secret to achieving happiness in your garden? Or some other message for gardeners? Those are beautiful. I assume they are for display purposes only. And how fortunate that one came with a note inside. A special kind of garden art. Oh I wonder what that note says? What a thoughtful gift! Those are full of stories, I bet, those old tools. You have given me a great idea for the old garden fork without a handle. It just sits in the ground doing nothing but it had a nice place to hide a note. Yeah, the tools are cool, but quit teasing us. Those look great. Old tools are marvelous and luckily I have found some at car boot sales, auctions etc for next to nothing. One of the best I found, was a pair of edging shears which has a lovely wheel on it so you are always at the right height and no strain at all to use. Very clever...!